Even listening "blind," I suspect I'd have pegged these as Russian performances. The opening 'cello phrase of the D minor Trio is distinctly melancholy; the violin, taking up the same theme, infuses the vaulting leaps with yearning; and the arrival of the "tutti" at 1:11 is rather grand -- or, at any rate, as grand as three instruments can make it. So it goes. 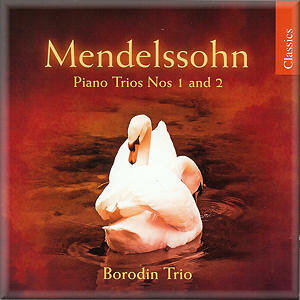 The Borodin Trio's heightened emotional scale doesn't turn Mendelssohn into Tchaikovsky, as one might fear, but the more turbulent passages of the D minor's first-movement development do suggest a sort of Slavic Beethoven. The pianist launches the Andante con moto tranquillo with a simplicity that recalls the Songs without Words, but the string players take over on the repeats with a saturated, vibrant tone, and the more unsettled second theme rises to unusually impassioned climaxes. The Scherzo comes off as both playful and trenchant, echoing its Midsummer Night's Dream counterpart in spirit. The Finale is cogent and persuasive, with the climaxes again bringing an added touch of grandeur and breadth. It's an impressive and satisfying performance, though likely to disconcert those who think of Mendelssohn's output as uniformly graceful and featherweight. Stylistically, the C minor Trio's outer movements follow more or less conventional patterns -- or perhaps I'd simply gotten used to the Borodin's expanded sense of scale -- but the playing still has its uniquely reflective moments. The Andante espressivo again juxtaposes the piano's gentle rocking rhythm with more heartfelt, sustained string playing; the players really bring out the expressive weight in the development's string of secondary modulations. This Scherzo, taut and volatile, recalls its counterpart from the Octet. The Finale's main theme, with its triple rhythm, has a nice swing; the players lean on their agogic stretches to maintain a firm propulsion. The sound quality is big, warm and vivid to match the performances, avoiding the excessive ambient resonance that would characterize Chandos's orchestral recordings. This budget-price reissue merits a warm welcome.